I have to write this small last chapter to conclude the story which hit me hard on February 22. As I mentioned in my art blog, I have accepted the inevitable. I had very strong hopes still all last week, unfortunately not everything happens as we expect. I am flying to Europe and after Thursday I would love to start living in the present and look forward to the future. It will have a lot of wonderful memories, and each picture tells a story. It will be difficult at first, but that is what life is about: we have to eventually move on. I am not somebody who wants to wave the flag of pain and sadness for the rest of my days. I believe we can immerse ourselves in a great future regardless of suffering and pain in the past and learn a lot from it. This post feels almost like keeping some unspoken promise. The story ends, but the legacy left to me lives on. My mom’s life consisted of hard work for the most part. She was never having any vacations, and the only trip she ever took was in 2010 to Canada where she spent a month with us. 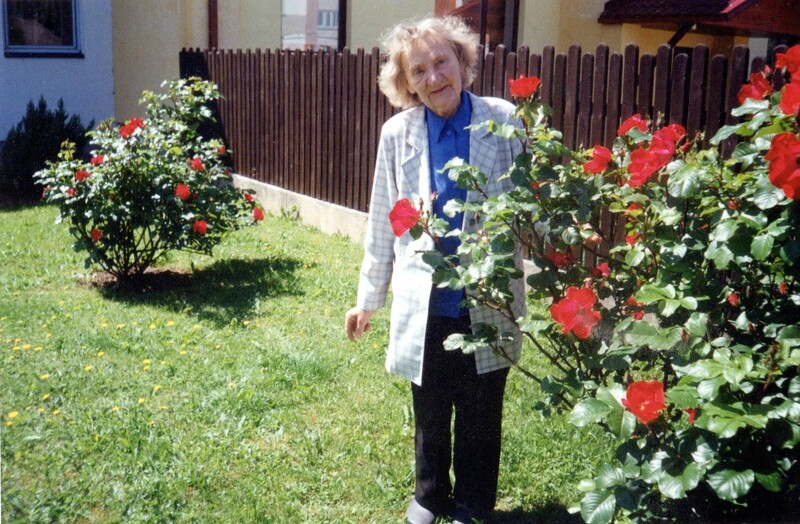 She went through the Second World War, and as her mother passed away in the result of an accident, mom had to take care about her twin siblings. They were 4 and she was 13. The house they were living in 1943 got hit by a bomb and they, too, rushed out of town and towards the Northern part of Latvia where there was still chance to survive without being hit by a stray bullet. There was starving and fighting for life, and there was complete insecurity, and she was just a teen, a kid actually, but she managed. Russians took over Latvia after the WWII, and that’s when a new battle began for my mom. Her dad and the older brother had been among the Latvian nationalist fighters, and the oldest brother had studied to become a priest. With such relatives, one couldn’t hope to get a good job or opportunity to settle down. Still, my mom worked at nursery school and sang a lot. She had a wonderful strong voice and she was very welcome to join the choir and performed at different gatherings. My dad returned from Siberia and GULAG in 1956. He met my mom and they got married in 1957. It was big love, honest and great relationship which provided with a family model me and my sister. They lived in a happy marriage for 48 years until my dad’s passing in 2005. Unbelievable, they reached almost the golden anniversary! I believe my mom was never quite as happy after the shock and pain following dad’s passing. 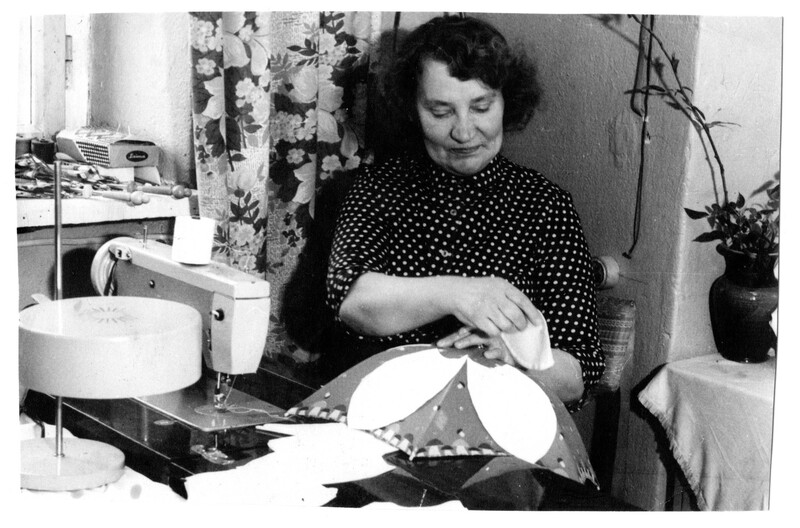 My mom was a wonderful fashion designer, and I learned sewing very early just watching her. She had a very vivid and bright imagination and turned her ideas into adorable dresses, suits, coats, blouses and so on. She never had just one job, she always worked for private clients at home, too, and afterwards in the garden up to the moment when it was so dark outside that one couldn’t see clearly. Music and flowers were always her big excitements. She sang and listened to others. She had exclusive taste when it came to interior decorating, personal style and personal image. I guess, I got that from her. She was extremely organized and neat and I have inherited that also. 88 years is quite a stretch of time. So much has happened and so much has changed. Her life could have been longer. The care she received at hospital was delayed, negligent and, as the final test showed, the treatment was wrong. Well, it’s too late to figure out what if. 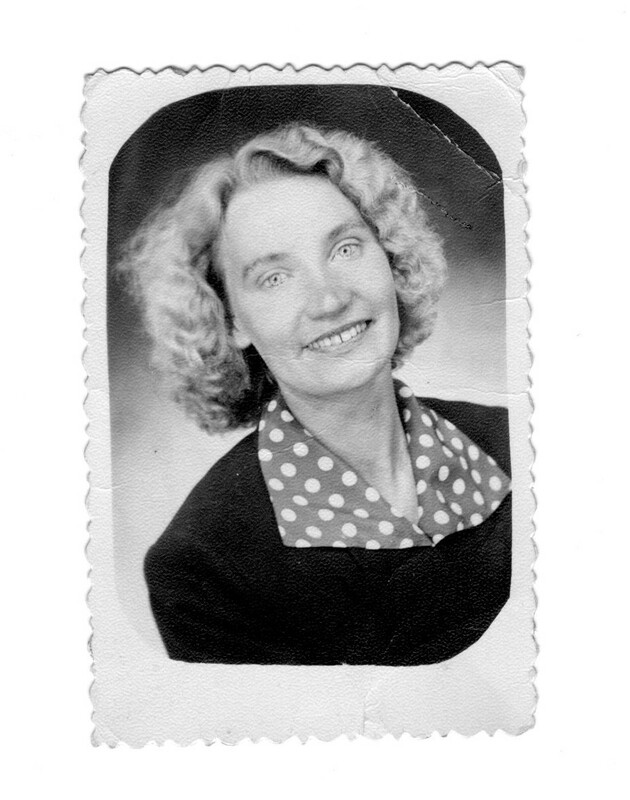 Mom was very much loved and deeply respected. May this small picture gallery serve as my input in celebrating her gorgeous life! Please, no more sorry messages, although I am aware that is what one wants to do to show their respect. There is a special post on my Facebook profile where one can leave such messages, link at the bottom. However, I would really appreciate comments about purpose and meaning of life, power of creativity and importance of art if you have ever been thinking about these matters. I am looking forward to a day without pain and sadness. It is the 4th day without my mom. I have come to accept the inevitable outcome. The main thing is: she was a wonderful mom who taught so much of life skill to children, grandchildren and great-grandchildren. She left a very meaningful legacy for us to follow. Flow of time: where does it take us? I arrived to Canada in 2004. I did not know what to expect, but I was very impressed by greatness of many things, and everything felt to me huge. I mean everything. Latvia where I came from is a small country, and, therefore, the endless wide roads, the high-rise buildings, the downtown Toronto with its busy streets and, especially, the size of any province was so different from what I was used to. 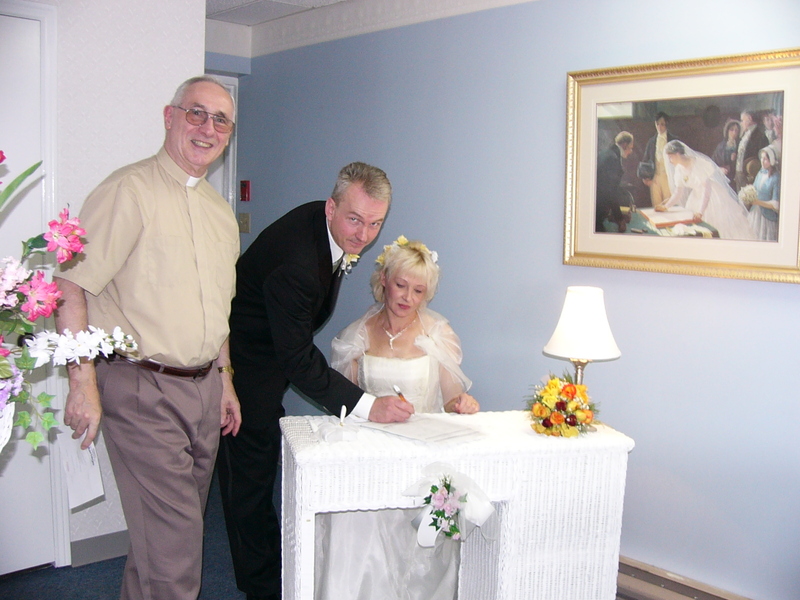 Well, time flew absurdly fast then, and I got married in October 30th of the same year. It’s very amazing that it is my daughter’s birthday on this day, too, which I hadn’t even realized when we made all arrangements. 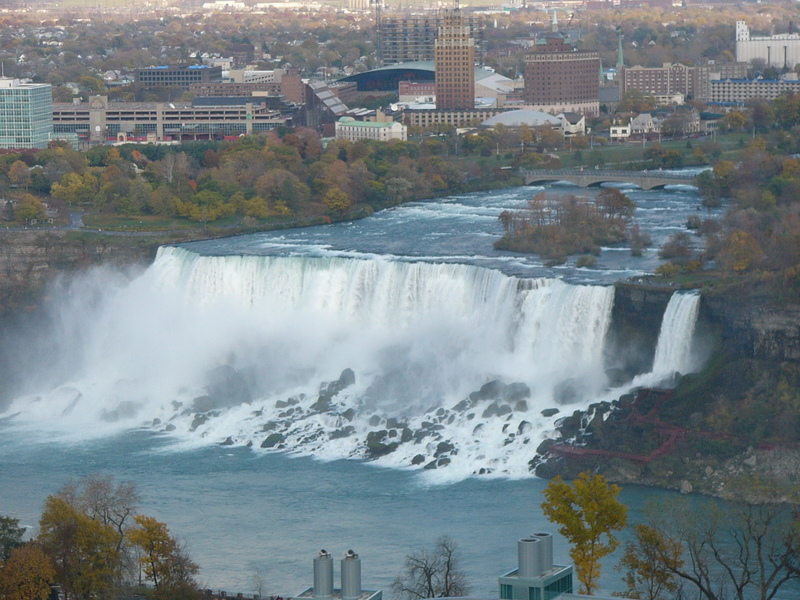 We stayed in Niagara Falls in a newlywed suite which had number 3010 on the door. Something else, or what? 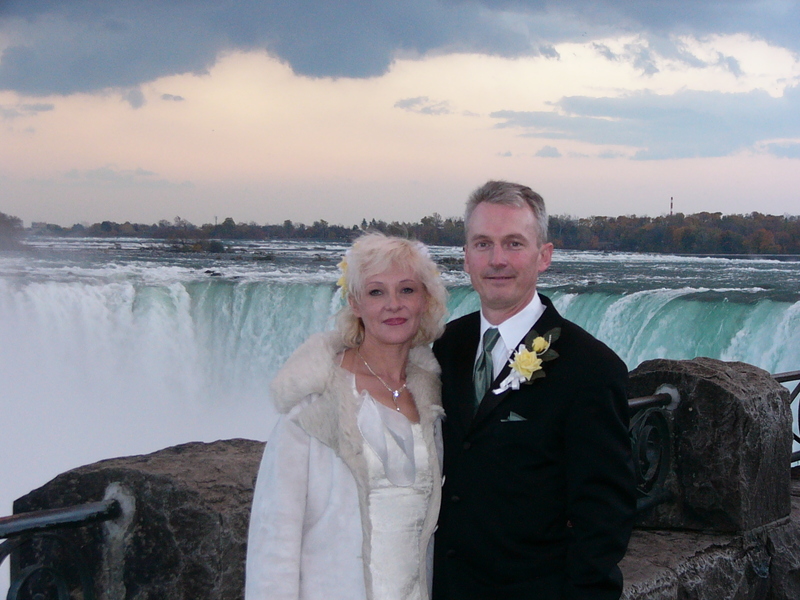 Well, we got married in The Small Wedding Chapel in Niagara Falls. My family was in Latvia, so, my fiancé decided not to invite his family also, just to be fair to each other. Very tactful, I’d say. Therefore we headed out to Niagara Falls the day before wedding. The weather was mild and sunny during the day, although, it was the end of October. These pictures were taken by the numerous by-passers who all kept congratulating us, so, it felt wonderful actually. I cannot believe it’s been 13 years. The flow of time is very different from what it was back then. The best part is that my daughter is 38 today and we celebrate the 13th wedding anniversary. So much fun together (over the internet because she is in Latvia). Everything worked out quite well. My husband has proved himself to be the best, most loving and most honest person ever and he is still the same excellent man who I met back then. He has had a lot of patience and understanding in the situations when my health really gave up. When we are saying “…in sickness and in health, to love and to cherish, till death do us part” at the wedding, we rarely can be aware of what is ahead in reality. It has not been all that smooth, but, thankfully, we are managing everything. While we are still very young we believe that nothing really changes as we get older, except it is a larger number. We assume we will have the same ideas and the same attitude, and the same capability when executing different things. That is so wrong! I just now have started to understand how my parents felt at older age, and I am very lucky to have my daughter as my best friend because my top energy levels matched time of her being young and very energetic and passionate. We are a lot smarter. Life teaches us if we are willing to pay attention and to learn the lesson. We find out that some ideas were simply silly and that the world isn’t there to please us and make miraculously our wishes come true without any effort. We have learnt that lots of things require fighting for them and that path can take a lot of turns, too. It’s never as if going from point A to point B. There are always obstacles and problems, and all kinds of disturbances. The most important things for a family are love, trust and respect. If any of these are missing, marriage is going to have cracks. The most important thing for an individual is the mental and physical health. While I have a lot of brain power, excellent memory and very strong willpower, the physical side is somewhat suffering. Well, I hope the future is friendly and has some better things for me and us. 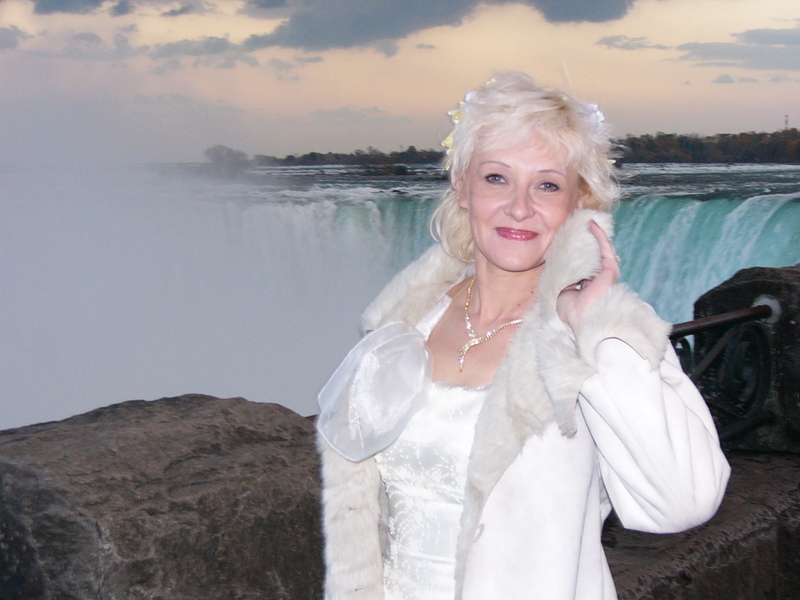 Being an older white, legal immigrant in Canada is not quite the same as being a refugee. Refugees are treated very well here and receive extreme support. I haven’t received any smallest or tiniest support whatsoever. My only support has come from my husband so far, and I am happy and grateful for that. Other than that, my expectations did not come true: I wasn’t met too friendly wherever I turned to in Canada, and I haven’t made too many friends locally, as well. Realistically, I was already 46 when I relocated to Canada; so, it’s not the same as when one is 16 or even 26. I have turned from a very social person (I worked at publishing houses, high schools and colleges in Latvia, it was work with and among people) to a very isolated person. My lack of health has contributed to that also, a lot actually, but still, I did not expect such ignorance from the local community and people. It has been as if approaching some unbreakable brick wall: there is very little interest about what I do and offer. I suppose one has way better chances if they have classmates, schoolmates, University time friends, childhood friends and obviously relatives in the country they work and live. Well, I have only my husband. Cheers to our 13 wonderful years together! I want to thank my husband and God for this great time and I certainly believe that the best times are still ahead of us. P. S. I have to apologize to fellow bloggers for their kind and numerous comments and likes to previous posts, as well, as thank you to all who keep following my art site https://inesepogagallery.com/ I will approve everything and I will return all likes as soon as get a bit better and all my stuff is sorted out. That won’t be today because it is our wedding anniversary. Thanks to everybody! I have a box of memories. This box holds everything which I could take with me from my past life in Latvia after I moved over to Canada. It is amazing how little space can be filled with memories of 46 years, and that’s all I have from there. As I’m going through yellowish pictures, some as old as I am now, some even older which makes them 70 or 80 years old, I’m having a look at my mom. She is so diligent, loves moving and doing everything so much that even now at 85 she is still busy in the garden and at the sewing machine. Her eyesight has worsened a lot, but that does not stop her. My dad was like that, too: always busy with something. We had a fantastic place over there in Latvia. It was a semi-detached house; quite honestly, it later caused a lot of problems just because it was not solely ours, and my dad built it practically from scratch, when we moved to this small town Saldus, it had only the outside walls and sort of main structures. He and my mom worked hard to make it a lovely living space. My mom is a born gardener, somebody who genuinely understands the nature and character of every plant and tree, and I believe I have inherited this knowledge because I have green thumbs, too. We had a huge orchard, 2 greenhouses and many flowers and vegetables, all kinds of them. 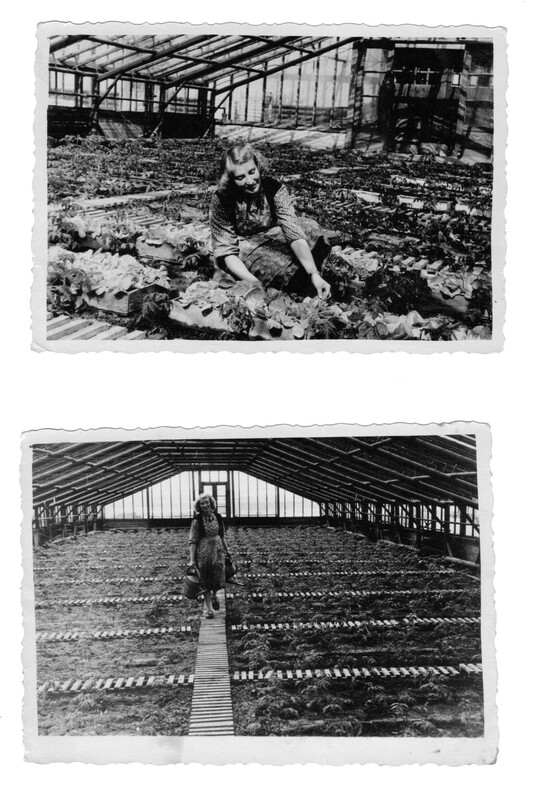 These, who know what life was like in the late soviet era, can recall how nothing was in the store, so most food which we had on our table came from our own garden. Thankfully, gardening was the greatest thing I could ever learn. I started helping early, we were just small kids: sister and I, but it was an unwritten rule that everybody has to participate in order garden and orchard received the attention they deserved. In my memories, there’s always spring and blossoming apple tress in this old place which doesn’t even exist anymore. I suppose, that will be my most favorite time of the year for as long as I live. There were white and sweetly pinkish clouds of blooms all along the garden path as we walk down the hill. The house was at the top of a hill, so when standing there, one was overlooking the most beautiful scene imaginable. Cherries, apple trees, plum trees, pear trees, black, white and red currant and gooseberry bushes were on both sides of the path. I think it’s not a coincidence I love painting garden path images. Whenever I think back, I am seeing my mom under these blossoming apple trees. It is spring, it is warm and sunny and dad works in the small shed he built, as well. Whenever I think about a mother and her importance in our life, I am seeing a huge apple tree, wide and strong and it carries its fruit through dry, rainy or stormy summers straight into the first frosts of the fall. 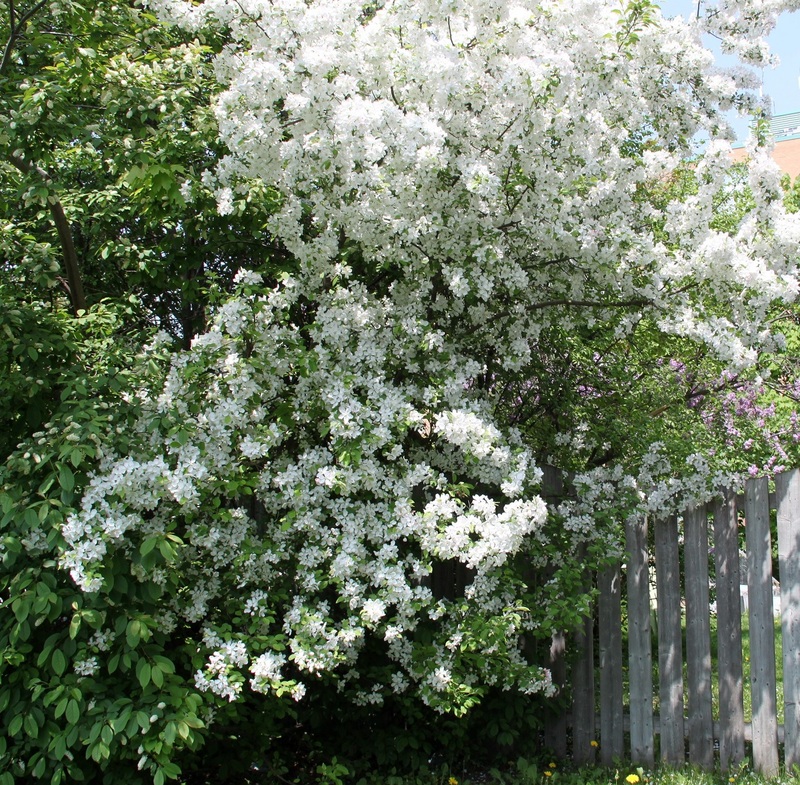 Branches are so strong and flexible at the same time, but they are in a full beauty in early May. 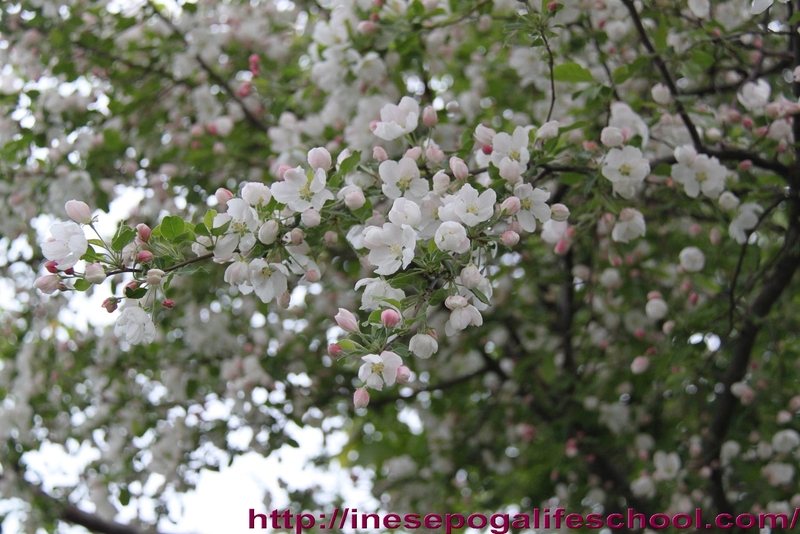 Mother and a blossoming apple tree are synonyms for me. I never developed extreme attraction or attachment to things one can buy, but I found an endless opportunity to express myself through things one is able to create. Therefore, creativity became my true existence. That is thanks to my mom who is the most creative person I’ve ever known. She created home decor, pillow cases and curtains, thousands of dresses, skirts, blouses, dresses, coats and jackets. She still loves designing and sewing aprons. She gives them as a gift to people who love cooking or doing work around the house. She could create any outfit one only can dream off. I took over this skill when I was 12; and when I was 13, I was wearing everything made by myself, that included coat, pants, skirts, blouses and tops. It takes my mom nothing to create the most beautiful flower arrangements, and I obviously am good at that, as well. I think my feel of good composition and balance within a space or image takes its origin right there: that is the way my mom would arrange things. Harmony and balance was the main feature of any of her creations. I’ve never eaten more delicious patties or home- made pies. Thanks mom for allowing me to become not a consumer, but so much more a creator of anything beautiful around us! I think it is a precious skill which carries me through life and makes my living so much simpler. Returning to the memory box: I was surprised how few photos I had from all these years. Well, cameras and smart phones were not available as they are now, so having taken a picture was a big deal. I cannot describe the heartache when these pictures didn’t come out as good as planned. It does not really matter whether I have only a few or lots of pictures. My memory has it all: the old house, the orchard and my mom under a blossoming apple tree. That’s all what matters.